Hospitals should give child patients virtual reality computer games as well as painkillers, a study suggests. An Adelaide hospital team found that immersion in a virtual world of monsters and aliens helped alleviate pain in children with severe burns. 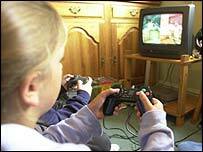 Seven children aged five to 18 were asked to play a virtual reality game while their dressing was being changed. When playing the game on top of having painkillers, they recorded a much lower pain score, BMC Pediatrics reported. Adelaide Women's and Children's Hospital used a game with a special headset housing two small computer screens and a special sensor allowing the child to interact and immerse themselves in a "virtual" world where they could shoot monsters. All of the children had also been given their usual painkiller. The children were then asked to rate how much pain they had experienced using a visual scale of cartoon faces - ranging from smiling to grimacing. Compared with when their dressings were changed under the cover of painkiller drugs alone, the children reported much less pain when they were allowed to also play the computer game. The average pain score with drugs alone was 4.1 out of 10, compared to 1.3 out of 10 with drugs and use of the computer game. By relocating themselves to "another world", the children paid less attention to the painful stimuli, said the researchers. "Provided a number of different games were available to cater for different age groups, it could be widely applied," they said. Liz McArthur, clinical nurse specialist in pain management at Liverpool's Alder Hey Hospital, said: "Play and distraction interferes with the transmission of pain. "Also, what causes children a lot of distress is the memories and anxiety they experience with painful situations. So distraction helps with that too. "And it doesn't have to be expensive. For example, we ask some of our children to imagine themselves in a different place." Dr Ann Goldman, consultant in palliative care at London's Great Ormond St Hospital, said: "It does depend on the age of the child. "We have a lot of quite young children where we use other things, such as blowing bubbles while a cannula is being placed. "It helps concentrate their minds and when they blow out it also relaxes their body." She said other research shows enhancing a person's natural coping style is most helpful. For example, some people deal with pain by ignoring it and pretending they are somewhere else, while others find it more helpful to focus on the pain, she said. Pain is detected by nerve endings which send information to the brain, via the spinal cord, which perceives pain. This transmission is complex and can be blocked, dampened or heightened by things like drugs, level of consciousness and emotions.